Today I found out why buffalo wings are called that. Unsurprisingly, neither the origin of the name nor the food item itself have anything to do with actual buffalo, nor American Bison which many people call buffalo even though they are not. 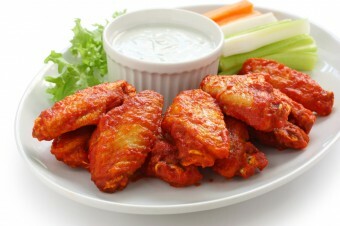 Rather, this tasty item originated in Buffalo, New York, with most foodstorians indicating buffalo wings probably were first served in the Anchor Bar there. Frank and Teressa Bellissimo owned that bar, which they had purchased in 1939. In 1964, Theresa had an idea: why not fry chicken wings up and serve them in a hot sauce? Of course, different stories come from all of the primary persons involved in terms of how she came up with the idea. First, it’s claimed that Dominic Belissimo, Frank and Teressa’s son, came in one night with a group of friends who were looking for a quick snack. Teressa was preparing some chicken stock for soups and sauces and decided to put the chicken wings in to broil instead, which she then presented to the boys. Dominic Belissimo told a different story: one Friday night the bar was particularly busy. As they attracted a mostly Catholic patronage, he thought he’d bring out something for them at midnight, when they could eat this sort of meat again. (At the time, many Catholics stuck to only fish and veggies every Friday.) He presented this idea to his mother, who found what she could in the kitchen: chicken wings. On the other hand, Frank told the New Yorker in 1980- perhaps the one that seems most plausible- that the bar had received a shipment of wings on accident; they had been expecting other parts of chicken, and simply didn’t know what to do with all of them. That was when his wife started experimenting in the kitchen to see what she could whip up so the wings wouldn’t go to waste. Whatever the case, the stories coalesce on this point- after spending some time experimenting in the kitchen, Teressa came out with fried wings smothered in a special hot sauce she’d made, served with blue cheese dressing and a few celery sticks. Needless to say, the crowd—whether it was Dominic’s friends, hungry Catholics, or just their normal patrons—loved them. Soon, buffalo wings were a staple on the menu and news of this tasty dish had come to the attention of many Buffalonians. At least, this is the official version of events.You see, there was a 1969 in depth article done on the Anchor Bar by the Courier-Express, and nowhere in there do they mention chicken wings being served there- a food item the restaurant was supposedly famous for at this point. A man named John Young threw buffalo wing history a curveball by saying he invented the wings. Indeed, his restaurant Wings n’ Things started serving chicken wings with his special hot “mambo sauce” in the mid-1960s. The main difference between Young’s wings and the Bellissimos’ wings was simply that Young’s were breaded and whole, while the Bellisimos chopped their wings in half (to make them easier to eat with your hands) and left them unbreaded. A local poultry distributor did come forward to say that both parties started buying a large number of chicken wings around the same time, but he of course saw no reason to keep records to prove who started buying the large quantities first. Who knew food-history was being made, after all? When former Buffalo mayor Stan Makowski announced that July 29th was to be declared National Chicken Wing Day in 1977, he chose to cite the Belissimos as the inventors, though of course he offered no real basis for his choice and there has been some small grumbling that because Young is a black man, in the 1970s perhaps it wasn’t a popular idea to give the credit to him. Young also stated that the invention of the Buffalo Wing wasn’t much of a leap for him as he grew up in an African American household and community where, according to him, chicken wings were a common dinner item, unlike elsewhere at the time where it was often more common to not eat the chicken wing directly, but use it in the preparation of sauces and soups. The real innovation then in his opinion was simply his special “mamba” hot sauce. Whatever the case, Buffalo wings remained a regional thing for quite some time. In the 1980 New Yorker article that interviewed the Bellissimos, the author noted that New Yorkers returning home from a few months away had to get their wing fix because they couldn’t elsewhere. However, over time, other restaurants serving the wings began to pop up. Buffalo Wild Wings is a great example of how buffalo wings spread to different parts of the country. It was founded by a man who spent some time in Buffalo before moving to Ohio. Unable to find a good place to get buffalo wings, he and a friend opened up their own restaurant in Columbus in 1982. The restaurant chain, which prides itself on sixteen different buffalo wing sauces, now has at least one store in every state except Rhode Island, and also has stores in Canada. And, of course, who could forget Hooters, which was founded in 1983 with wings a central feature on its menu. This spreading of the buffalo wing was relatively slow until American Football stepped in. What happened? From 1990-1993, the Buffalo Bills made it to the Super Bowl four consecutive seasons. During this time, the media covering the team also did features on the region itself, including talking quite a bit about local food and particularly highlighting these spicy, fried chicken wings. From there, Buffalo wings saw a huge surge in popularity, including becoming a “traditional” snack to eat while watching American Football as it still is to this day. The original buffalo wing sauce is a combination of melted butter, hot sauce, and cayenne pepper. Today, it’s usually available in hot, medium, or mild to suit everyone’s taste buds. Traditionally, the wings are deep fried and then tossed with the sauce, though sometimes the wings are served dry with the sauce on the side. “Buffalo” is now attached to other items, as in buffalo shrimp or buffalo pizza. This simply means that buffalo sauce used on chicken wings has been put on shrimp or pizza instead. As for how Buffalo, New York got its name, well, that probably is related to the American Bison, which as stated are often inaccurately called Buffalo. Buffalo- the city- started out on the already named Buffalo Creek. Though many different theories exist, it’s likely that the creek was simply named after the common nickname for American bison, prized for the ample buff leather their hides produced. Some modern sources contradict this, saying that there were no bison in the area to name it after, but early accounts of explorers describe American bison and it’s believed they were widespread east of the Mississippi before the population in the New World began growing. The real story is that Buffalo wings came about as a result of a family neighborhood bar owner (the kind of bars that exist primarily in big cities in the north; they are almost like a neighborhood speak-easy), who, in 1969, was anger at some patrons who were drunk, loud and wanted something to eat even though the bar had closed. She went to the kitchen, took some chicken wings, the left over stuff no one eats, and fried them and put hot sauce (melted butter and cayenne powder, lots of cayenne) on them with cerelry and blue cheese dressing, and said “Eat this!!”. The guys ate them and said, this is great, much to her surprise. The rest is history. I mean, who would eat such a concoction? According to a sign on the Anchor Bar that I saw in the early 90’s, wings were invented in 1961. Buffalo Wings weren’t “invented”. They are simply a variation on the English dish known as devilled bones. These were frequently made with wings, although they could be made using any leftover animal bones that had very little meat on them. The idea that prior to that 1960s no one ate the chickens wings and they were just thrown away is obviously ridiculous. This makes any of these stories seem suspect, at best, and completely fabricated, at worst. paste, a little vinegar & honey, some black and red pepper and fresh garlic. to re-use FRIED-BATTERED wings that had been sitting a while – the sauce nicely re-moisturizes the meat and drives the flavor in. Either way, a damn fine appetizer! Indeed, there is a great deal of mis-information in this article. Starting with the etymology of the name. It was derived from the French, Beau Fleuve = Beautiful River, referring to (Buffalo) Creek. I lived in the Buffalo area in 1965 1966 and wé ate chicken wings in the local bars. I don’t remember any mention Buffalo was the first city to have served wings. At the time we were under the impression that they were first served in Tonawanda. It was a long time ago.